With additional flurries making their way across our region overnight, I didn’t waste time yesterday cleaning up the random inch or two of snow that had accumulated over the previous week. That will be today’s project. 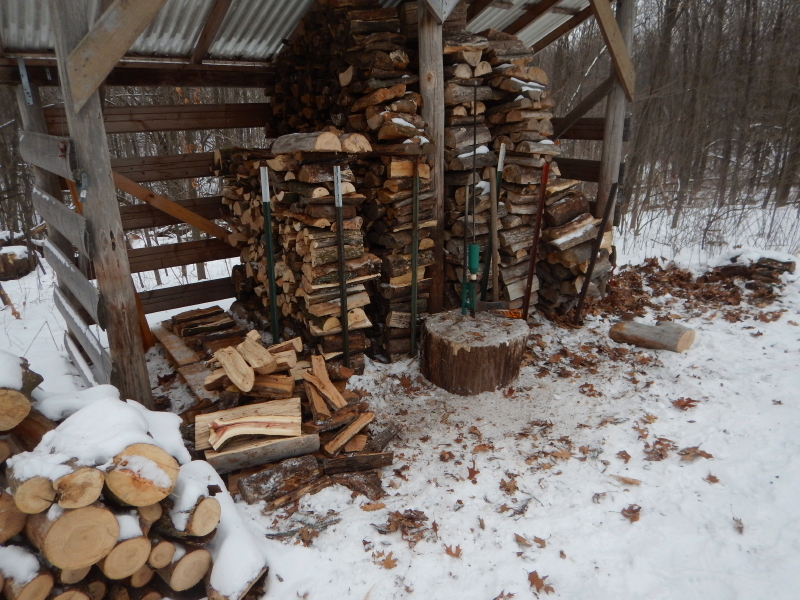 Instead, I made my way back to the wood shed to put in some quality time splitting firewood. 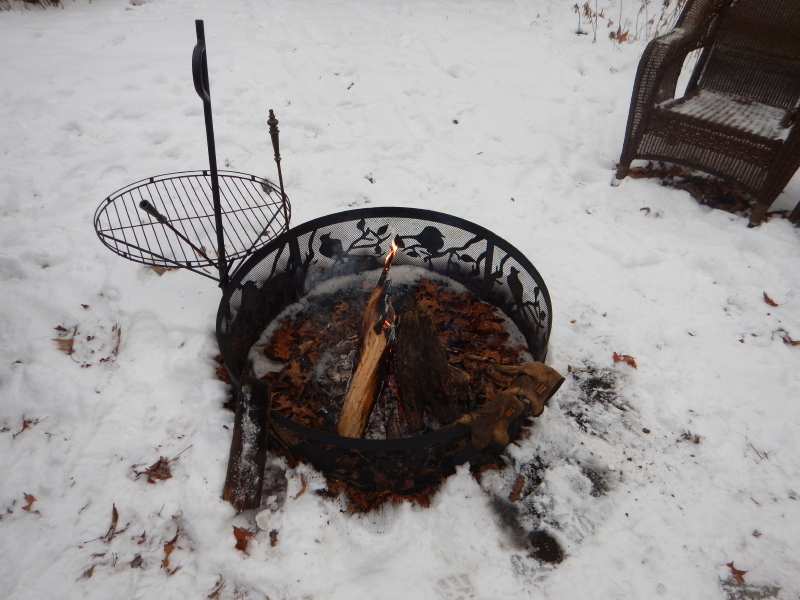 Hoping to keep me from wandering off to some other more enticing opportunity, in case the splitting didn’t turn out to be rewarding enough, I decided to build a fire. It helped to create an inviting atmosphere and an occasional distraction which enticed me stay on the task for most of the day. Working alone, my momentum wasn’t very consistent, so the day-long effort only produced a fraction of a day’s result, but it proved to be mentally rewarding. Throughout the process of trying to make piles of logs disappear, it occurred to me how our focus changes depending upon what we are trying to achieve. When cutting limbs and branches of a fallen tree, the goal is to get the wood into manageable pieces, working at whatever angle is available. The focus is on not getting the saw pinched or having a limb fall on you. When my focus shifts to splitting, I want logs with a flat, square cut that will stand nicely on the base of my splitter. It would be great if I had avoided leaving a joint right in the middle of the piece, too. When splitting, I quickly discover the cutting involved a very different focus. The same thing happens when I’m plowing snow. In the winter, the goal is to get the snow removed from the driving surfaces. Sure a few rocks might get pushed into the grass. It just isn’t enough of a priority to matter that much. In the summer, when we are trying to rake all the rocks out of the grass to facilitate mowing, the focus is very different. Suddenly I care a lot more about that detail. Similarly, when I am stacking wood in the wood shed, I just want to fill it to the top, grabbing whatever odd pieces are in reach and plopping them on the row. As the wood dries, it shrinks. The stack shifts. The wind blows. The stack leans. Eventually, the stack topples over into a messy jumble. 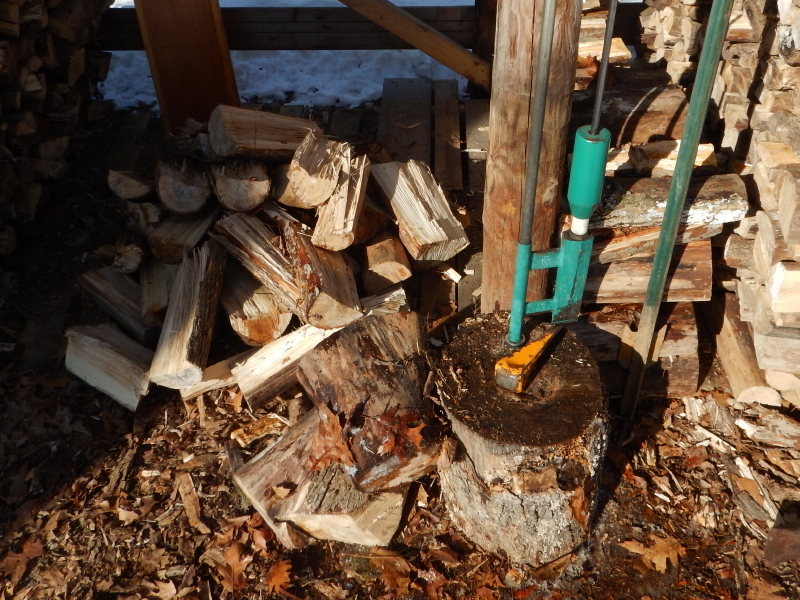 As I am re-stacking the firewood, I always question why I couldn’t take the time to split the logs cleanly so I could stack the pile sturdy enough to hold up. Pay for it now, or pay for it later. I wonder what I’m neglecting to appropriately pay for today, that will show up demanding collection later. Gosh, it’s almost like a life lesson. I decided to practice a little preventative maintenance on my log splitter and ordered spare parts before they completely failed. I had noticed that the nylon impact bushing was beginning to deform and one of the washers on the bottom spacer had already fractured. In a quick search, I found that both of these parts were readily available to extend the life of the product, so I made the buy. In this picture, I’ve already installed the new parts and bagged the old ones, which I’ll store in the off-hand chance of future unexpected failure. I saw in the review comments for the parts that some folks had the impact bushing fracture. It has helped me to be more aware of how my use of the splitter stresses these parts. I am less driven to pound away on a log that is obviously not giving in to the idea of my wanting it to split. The temperature was just about to climb above freezing when I started yesterday and the frozen wood was snapping apart with minimum effort. I was thinking I should get Cyndie to record a video to demonstrate how slick this tool is. I’m glad I didn’t, because no sooner than having that thought did my luck swing and the wood changed to stringier oak. I also came to a few Y-shaped pieces. These reveal the amazing strength at that junction which allows branches to support such incredible amounts of weight in big old trees. You need to pick your angles carefully to convince the wood to separate at the junctions where branches Y off. 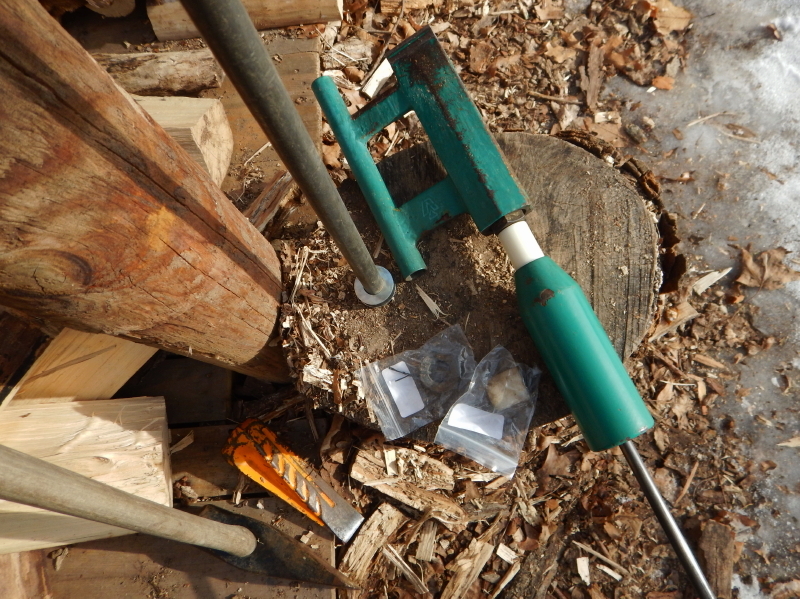 When a log is particularly resistant to the intrusion of the Smart Splitter wedge, I employ the added incentive of the orange twisting wedge and some pounding with the traditional splitting maul. It makes for a lot more effort, but I surprise myself by the eventual success I’ve been able to achieve in the face of some pieces that look like they would require the power of a machine. I had a nice session of progress, saving a couple of the bigger challenges for later, since my energy had declined as morning turned to afternoon and it was time for some lunch. Later, on my way to another task, I stopped to muscle the last two challenges. 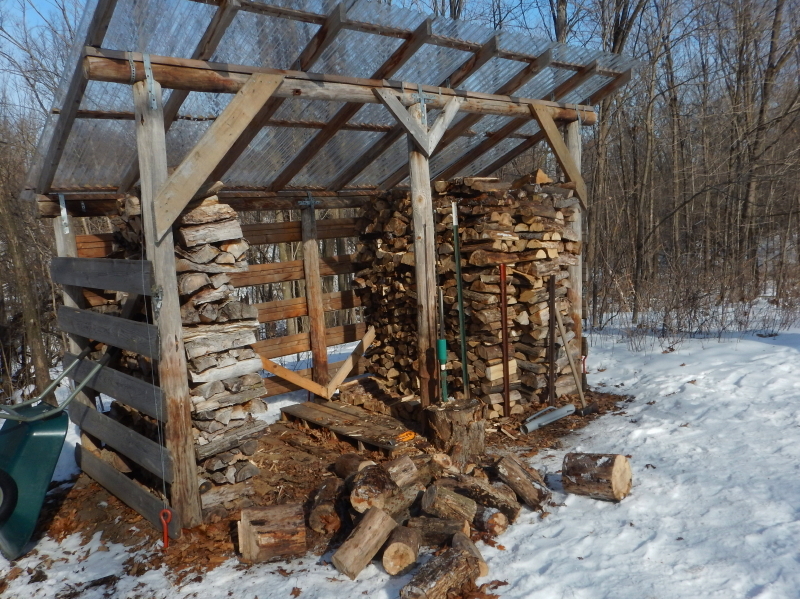 I have incentive to get our current piles of wood split and stacked in the shed. This coming Thursday and Friday is our appointment for the tree trimmers to come cut high branches from our old trees. I’ve instructed them to focus solely on dropping branches that are out of my reach. I will cut and split, or shred with the chipper, all the wood that comes to the ground so they don’t end up wasting any precious time (or our limited funds) on something I can do later. I think that cleanup project has the capacity to become an ongoing chore that will last me for the rest of the year.